A culture shift gathering: Music - Workshops - Visionary Arts - Ceremony - Yoga! Join your soul tribe for an all acoustic/live music transformational festival experience in a magical hot spring resort in charming Ashland Oregon. 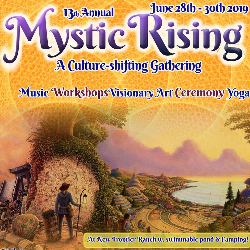 Mystic Rising is a "Family Reunion" of the best past Mystic musicians blended with new rising stars. Between sets, wander the grassy grounds of the Jackson Wellsprings spa for swimming, Hotsprings soaking, late night acoustic campfire jams, visionary art, teahouse, workshops, healing, massage, yoga, permaculture workshops in our organic garden, and an abundance of healthy organic food grown on site. For three days, we journey together in a lively experience of community healing, connection and thriving!